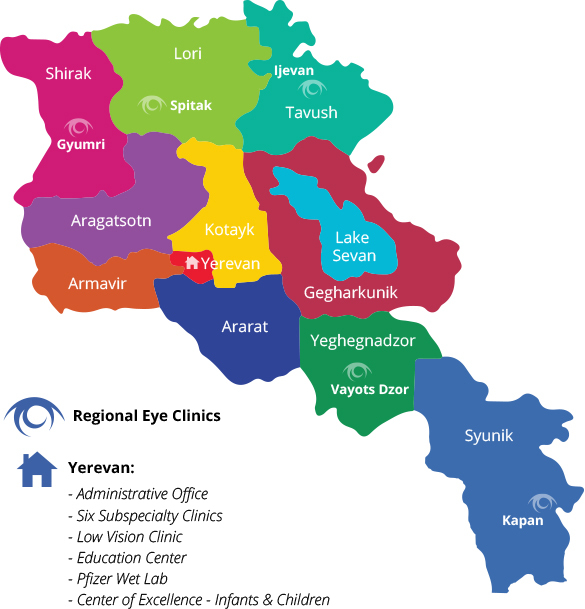 To commemorate 25 years of service, each month this year the Armenian EyeCare Project will feature a key element of our organization that has allowed us to bring eye care to the people of Armenia. Last month, we shared the story of our beginning. This month, we tell the tale of our first AECP fellows — four physicians in Armenia who were selected by our organization to study ophthalmology abroad and return to Armenia to open their own subspecialty clinics. This is the story of our first four Fellows. “Our principle effort is to educate,” says AECP Founder Dr. Roger Ohanesian. “Our ultimate goal is to allow Armenians to take care of themselves.” Medical training and education is the cornerstone of the EyeCare Project’s programs. 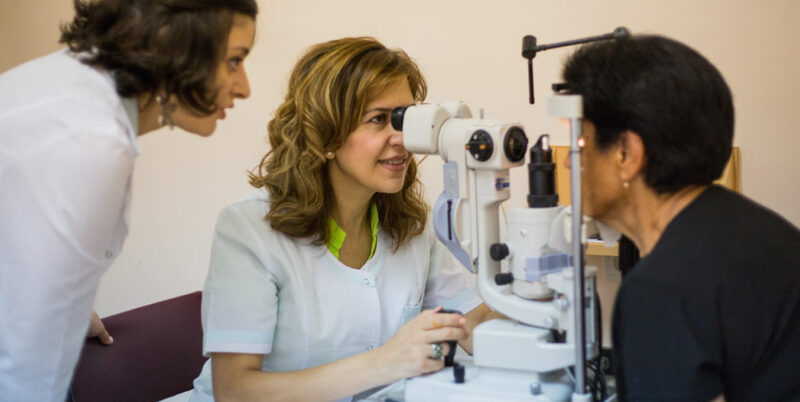 As ophthalmologists in Armenia are given the tools and training necessary to become experts in their field, they are able to share their knowledge and train their colleagues to create a broad group of highly skilled Armenian physicians in a number of different specialties. 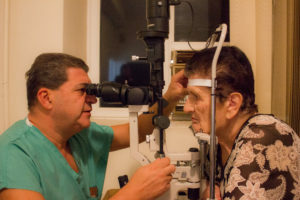 Founded in 1992, the EyeCare Project, with its physicians, began traveling to Armenia twice a year to teach physicians and treat Armenian patients. 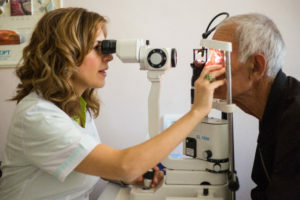 It became apparent early on that to have a long-term sustainable impact on eye care in Armenia, physicians in the country would have to have a much higher skill level and would require extensive education and training. To accomplish this and enable Armenian physicians to treat their patients independently, at a level commensurate with U.S. eye care, the Project established a Fellowship Program. The EyeCare Project carefully evaluated the skill levels and the potential of each of the Armenian ophthalmologists. The objective was to select one physician for each subspecialty. They would each travel to the U.S. for one year to train at one of America’s finest medical institutions. At the conclusion of their fellowship, they would return to Armenia to establish and direct clinics in their subspecialty and train their colleagues. “Both a great honor and a big responsibility,” said Dr. Armen Vardanyan when he was selected as the Project’s first AECP-AAMSOC Fellow. Chosen in 1996 as the first AECP-AAMSOC (Armenian American Medical Society of California) Scholar, Dr. Vardanyan studied with Dr. Barry Kuppermann at the University of California, Irvine (UCI.) One of the most highly acclaimed and talented ophthalmologists in the world, Dr. Kuppermann was named one of the “Best Doctors in America.” During his year with Dr. Kuppermann, Dr. Vardanyan was able to gain invaluable skills, which he was able to transfer to his colleagues in Armenia and establish a Retina Clinic. The clinic, opened in 1998, specializes in vitreo-retinal disorders and treats those who experience loss of sight that can’t be fully corrected with eyeglasses, contact lenses, medicine or surgery. As Chief of the Vitreo-Retinal Disorders Clinic, Dr. Vardanyan has spent the past 20 years examining and treating thousands of patients in Armenia at his clinic. He examines about 50 patients and performs approximately 15 surgeries each week. Dr. Vardanyan attributes many of his accomplishments in medicine to his AECP fellowship. Dr. Lilit Voskanyan was selected as an AECP-AAMSOC Scholar in 1999 and did a one-year fellowship at the University of California, Irvine, with Dr. Richard Hill. Recognizing that the level of medical knowledge and skills in Armenia was far below that of developed countries due to the many challenges the country faced following independence in 1991, Dr. Voskanyan wanted to take advantage of every opportunity for advanced education available to her. Upon her return from the U.S. to Armenia following her fellowship, Dr. Voskanyan opened the AECP Glaucoma Clinic in 2000. As the Director and Chief of Glaucoma Services, Dr. Voskanyan treats 18,000 patients per year, does a large number of surgeries, and trains her colleagues. AECP Founder Dr. Roger Ohanesian noticed Dr. Anna Hovakimyan’s medical talents while on a Mission in Armenia. In 1999, she was selected as an AECP-AAMSOC Scholar and offered a one-year fellowship at the prestigious UCSF Proctor Foundation in San Francisco. When Dr. Hovakimyan arrived in the U.S., she initially felt deflated. It was clear to her how much she didn’t know about eye care, sharing with us her surprise that the medical books in America had 50 pages on one disease compared to just one or two pages in books back in Armenia. “I felt that I really had very little knowledge of what was going on in the world,” Dr. Hovakimyan said. But, with a wealth of knowledge at her fingertips, Dr. Hovakimyan began to learn everything about eye care she possibly could, attending conferences, observing surgeries, and making copies of countless pages in ophthalmology books so she could take them back to Armenia. When Dr. Hovakimyan came back to Armenia, she established the Corneal-Uveitis Clinic inside the Malayan Ophthalmological Center in Yerevan. Opened in 2001, the clinic serves nearly 20,000 patients a year and, as Chief of the Clinic, Dr. Hovakimyan performs about 1,000 surgeries annually, including cataract, cornea transplant, stem cell and much more. Dr. Hovakimyan attributes the success of her clinic to her fellowship made possible by the AECP and all the knowledge that came with it. Dr. Armine Gharakeshishyan was awarded a one-year AECP fellowship in 2003 — just one month following the birth of her first child, a little girl. Though extraordinarily difficult to leave her new baby with her husband and mother-in-law, she knew it was her best — and only — opportunity to advance her education and perfect her surgical skills. For the first six months, Dr. Gharakeshishyan studied neuro-ophthalmology and orbital surgery (facial reconstruction) under the auspices of Dr. Steven Feldon, Director of the University of Rochester Eye Institute in New York. The following six months, Dr. Gharakeshishyan applied what she learned by performing surgeries at the LV Prasad Eye Institute in Hyderabad, India. Returning to Armenia in 2004, Dr. Gharakeshishyan established the AECP Neuro-Ophthalmology and Orbital Surgery Clinic. Seeing approximately 350 complicated cases each month, Dr. Gharakeshishyan has become experienced in a subspecialty that was not available in Armenia prior to her fellowship — reconstructive, or plastic, surgery. Dr. Gharakeshishyan is now able to offer these services to those in Armenia who need them. Her specialties include thyroid ophthalmia, ptosis (drooping eyelids), strabismus (eye deviations) and aesthetic problems with the eyelid.